This is the second blog in our advanced metrics series, which looks at the KPIs you can use to optimize and improve your maintenance operations. We’ll discuss what these metrics mean and how they can be calculated in Fiix. In the first instalment, we took a look at mean time to repair (MTTR). Now, let’s look at mean time between failures (MTBF). What is mean time between failures? 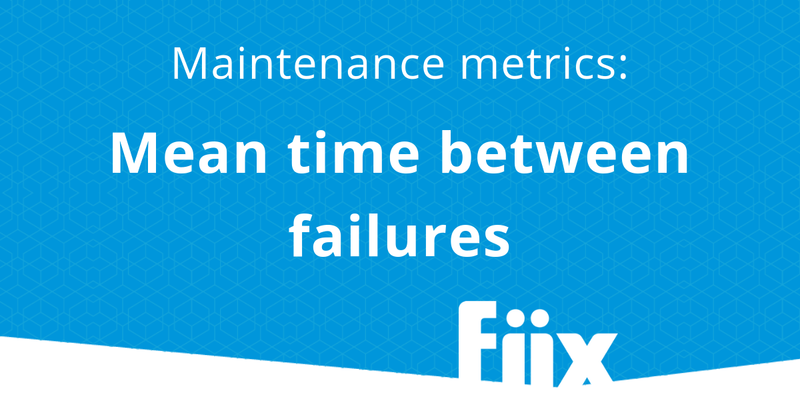 Mean time between failures is the average time between system breakdowns. For mission critical or complex repairable assets such as generators, tankers, or airplanes, MTBF becomes an important indicator of expected performance. It has also become a fundamental component in the design of safe systems and equipment. MTBF does not take into account any scheduled maintenance such as recalibration, lubrications, or preventive parts replacements. While MTTR affects availability exclusively, MTBF affects availability as well as reliability. Read our "Advanced CMMS Metrics" eBook to find out how you can measure them with your CMMS software. There are a number of factors that can influence MTBF one way or another, and most of these are human. Was a product or component applied in the right way? Did the actions of the technician during a previous repair contribute to the failure? Mean time between failures is usually measured in hours. For accuracy, this measurement includes only operational time between failures and does not include repair times (assuming the item is repaired and begins functioning again). MTBF is a great way to quantify the reliability of a system. It refers to the average time the asset functions normally before it fails, so it can be used to predict performance. These figures are often used to project how likely a single unit is to fail within a given period of time. Organizations that provide automobile breakdown assistance, for example, factor in MTBF when determining pricing. The more likely the average car is to break down, the more they have to charge. MTBF can also be useful in determining the frequency of inspections or preventive replacements. If your system is failing for the same reasons, you could use the MTBF data to introduce some preventive actions such as greasing, inspections, calibrations, preventive repairs etc. How do you measure MTBF in Fiix? Manufacturers may provide the predicted MTBF for a system or component to indicate its expected reliability based on intensive testing, but take this number with a grain of salt—the calculation could be based on data from newer generations and technologies while your organization runs an older model. For a more accurate representation of MTBF, we need an estimation based on actual field data. It is possible to pull MTBF for your particular assets data directly from CMMS software. When an asset goes down for repair, simply select the reason that accurately describes the situation. Reasons to set an asset offline can be configured in the lookup tables in the settings section. When the repair is complete, log the system back up to production. This online/offline data is then used in the MTBF calculation.